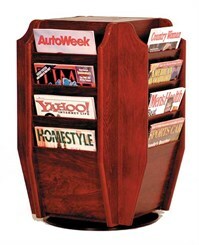 Our oak rotating carousels are the perfect way to organize magazines in a compact, attractive rack. Racks are constructed with 3/4" solid oak sides finished in choice of Oak or Mahogany. Magazine pockets are 9" wide x 3/4" deep x 8" high. Measures 18"W x 18"D x 25"H overall. Ships fully assembled. Shipping weight 42 lbs. PRICE INCLUDES FREIGHT! Please allow 1-2 weeks for delivery.